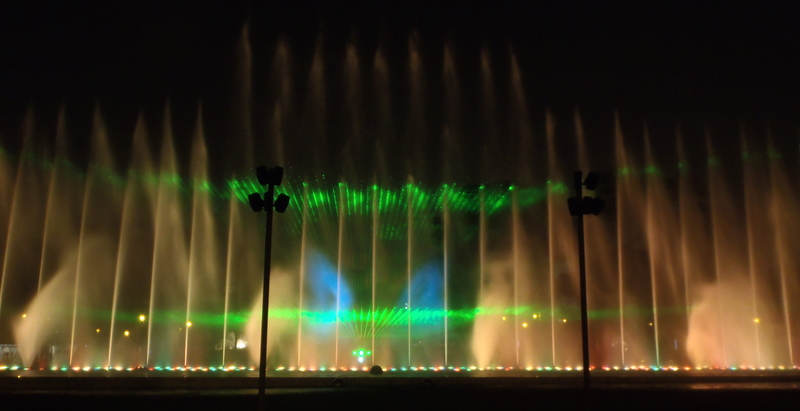 Lima boasts the biggest fountain park in the world, Circuito Mágico del Agua (The Magic Water Circuit ). I had pretty much no idea of what I was going to see. 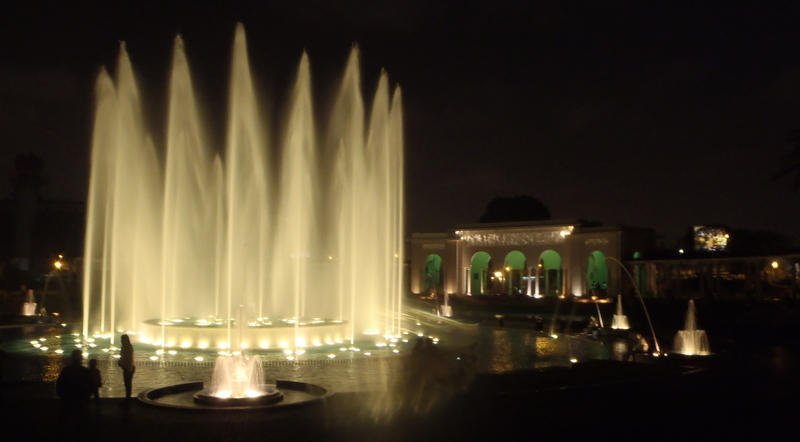 My great-aunt had told me that I really should visit the park whilst I was in Lima, that it was great, and that it was best to go in the evening. Listen to one´s elders. 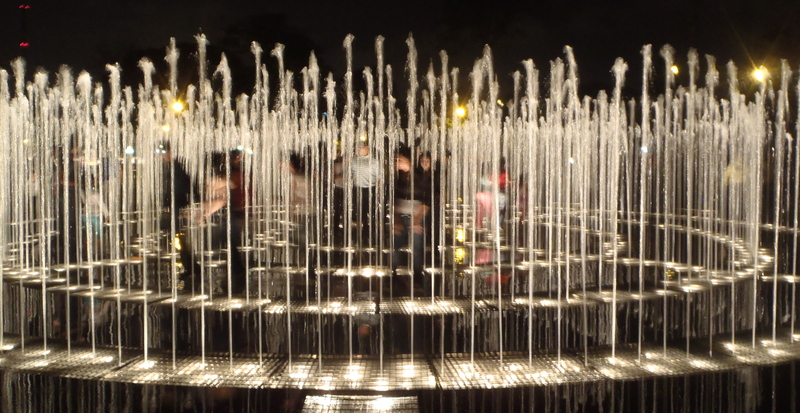 Set within Parque de la Reserva, it´s only since going that I´ve found out how much of a Lima highlight it is: it is one of the most visited attractions in the city and has won the Guinness Record for the largest water fountain complex. The city is clearly proud of the parks 2007 regeneration, hostels advertise it on their walls, Time Magazine say it is one of the main things to do in Lima and my great-aunt thinks it rocks. What´s stopping you? My visit started with the 7:15pm Fuente de la Fantasia (Power of Imagination) show, a feast of colour and 3D projections in sync to a range of musical tracks (something to suit each family member, a little flamenco, some pop, some classical). A ballerina danced around to Swan Lake. She was eerily ´there´, far larger than life, the water droplets allowing definite detail to be seen. A man and woman were projected dancing the tango. Couples watching the show cuddled in closer; a dusky, mystical setting prime for romance. But the whole thing was, despite the visual spectacle, a little on the kitsch side and reminiscent of the shows at Disneyland and Disneyworld. Not that that´s a problem; those shows and places bring in the punters. I enjoyed it but at the same time found it a little too much. Personal taste, and all that. 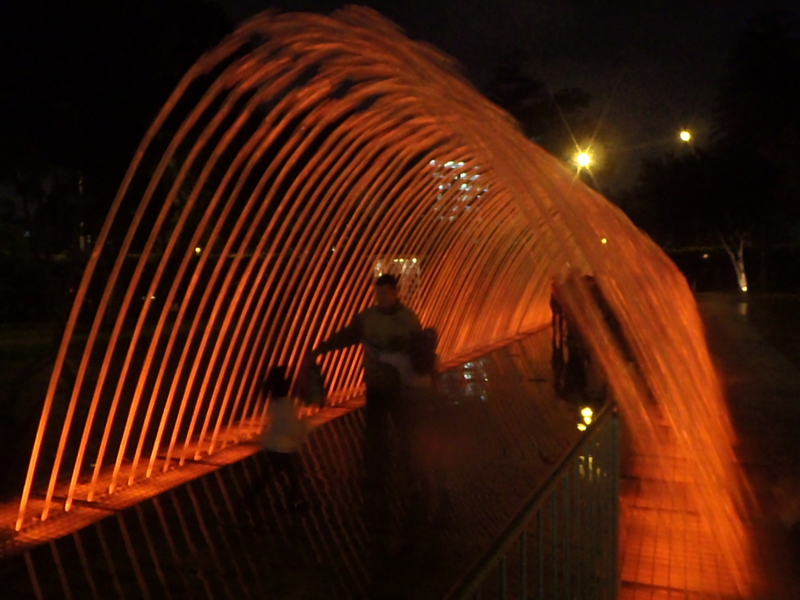 Following on from the show came observation and play time: a wander around the various fountain displays, walking through tunnels of curved water shoots, running into the centre of the Fuente Laberinto del Ensueño (Labyrinth of Dreams) and getting wet and dancing about. The latter was the most fun. Children jumped across the momentarily dormant water jets, often too late as the spurts regenerated and drenched them through. Some adults also took up the challenge of getting to the centre of the maze. Smiles and laughter and magic were in the air. And soggy clothes characterised the park exit. It was definitely a place to take in some man-made beauty, to enjoy the manipulation and amalgamation of light and colour and water and sound. People watched in awe, they clapped, they wandered around and chatted and ate churros and candy floss and went home smiling. The park is open from 6:00am-1:00pm Mon-Wed and 3:00pm-10:30pm Wed-Sun. Shows are Wed-Sun at 7:15pm, 8:15pm and 9:30pm. Admission to the park is S/.4, under 5s go free. I’m sitting in Plaza San Martin, my head protected from the beating sun. The plaza is framed by high, off-white neo-colonial and baroque buildings with fat pillars and stone balconies, Father Christmas in red, garish plastic hangs from one of the wide windows on the corner of the plaza. To one side of the square, a statue of Saint Martin sits astride a horse. Friends gather for a lunchtime chat, munching on choclo (corn on the cob). A couple sit arguing on one of the curved, stone benches whilst children chase pigeons, jumping and shrieking when they come close to catching the birds. Horns honk continuously. The traffic is busy and people are impatient. This is one of a few significant plazas in downtown Lima, reached easily from Estacion Central. I lunch at Don Quto. Down a little alley off Plaza San Martin, it feels like a temporary restaurant stuck on to the side of a building. The almuerzo menu is the most extensive I’ve seen yet in Peru and I settle for a Sopa de Moron as my entrada, a cereal, stock and parsley based soup with chicken legs and some other meat which I think is liver, settling at the bottom of the bowl. I leave the chicken legs. There’s barely any meat and I don’t fancy chewing on bones. My travel buddy opts for Crema de Rocoto, a cold starter of potatoe slices covered in a creamy, orange, chilli pepper based sauce. We both divert from the Economico menu and go for the Arroz Chaufa con Pollo (Asian style rice with spring onions and chicken), a generous, hot dish. No drinks are included on any of the almuerzo menus, but at S/.8 (£1.89) for central city food, it seems a pretty fair price. I try to get through the pile of rice but it barely seems to shrink and I eventually admit defeat, grease sitting heavily in my stomach. Wandering the streets of downtown Lima is pleasant enough. There are plenty of shops for those who want to splash out on something new, nice stops for ice-cream, and casinos to duck into if you’re feeling a bit flash. The buildings feel quite imposing, reaching up to a high skyline. Up by Plaza de Armas is the Catedral de Lima and a little further along is the Palacio de Gobierno – the governmental palace – a strong, grand building with guarded entrances. I headed along Junin to the Museo de la Inquisición to learn about the treatment of Peruvian prisoners during the Spanish Inquisition. The entry is free and includes a guided tour of the exhibits; however, on this particular day it was only available in Spanish. Typical. I got a feel for it though, the cramped cells and life size wax works in various states of contortion providing sufficient information to understand the horrors of the time. Most backpackers stick to Miraflores or close by Barranco because they’re convenient and familiar and full of hostels and places to make merry. The party hostels, such as Loki and Pariwana are in Mirafores where they stack you high and provide and organise everything from food to tours to happy hour and evening entertainment. For many 18-25 year olds travelling through Peru, these chain hostels are the default places to stay. But if you want something a bit more cultural, historic and interesting then try a hostel or hospedaje in the historic centre of Lima. ‘Oh my god’. The American drawl of a yummy-mummy doing lunch with her toned buddy hits my ears. ‘I didn’t realise that she had children from a previous relationship’. They are on the sofa in Starbucks, turned in to each other; comfortable friendship. And familiar environment, I would imagine. I have been here for over an hour making use of the Wi-Fi and catching up on a pile of emails but these two were already chatting when I arrived and they look in no hurry to leave. All the time in the world, it would seem. This is La Molina, a tidy suburb of Lima. The streets are organised and clean and lined with trimmed plant life. Houses are beautifully presented – not too grand – but fresh and architecturally balanced and considered with pleasing curves in all the right places. It feels a fairly safe neighbourhood, especially once inside the security gates that block the entrance to nearly all residential streets. But it also feels a bit separate to the overall reality of Peru. Women come out of gym sessions in tight, new workout wear, men in expensive suits sit with colleagues for a coffee and chat, and young cool adults lounge with laptops and expensive Frappuccinos. This is a place of professionals and expats, of ladies who lunch and rich kids who hang out, a place where I feel a scruff and where my backpack is an incredibly foreign and frowned on article (although people just stare, they’re far too polite to frown publically). Miraflores, another district of Lima, heaves with people of all nationalities; professionals and backpackers side-by-side. It is gringo central with tonnes of hostels and standardised eateries catering for the unadventurous or those seeking something safe and comforting. Up at the top end by the central park, it doesn’t seem to possess the same self-assured affluence of La Molina, probably because a fair few of us scruffy travellers bring the place down a notch or two. But don’t be fooled; it is pricey and upmarket compared to much of Peru. Miraflores is clean and Western and convenient. It has the edge of being beachside, of being a place of leisure with opportunities to paraglide and surf or whack a ball in the tennis courts. To actually live here rather than pass through the place highlights the inaccessibility for most Peruvians who earn on average S/.1,148 per month (although this is based on figures from Lima). To rent a two bed flat in Miraflores would set you back around S/.3,790 per month ($1,400 / £900), but you would get an immaculate, modern apartment for the price within a stone’s throw of the beach and bars and restaurants. Obviously not an option for most. La Victoria and the Tacora area of Lima offers up a complete contrast to the wealth and style of Miraflores and La Molina. It fulfils the expectations of a tourist in Latin America, being undeveloped and rough around the edges with a hint of danger and disorder. Battered, dirty buildings are cramped into littered streets that swarm with people, a heaving district on the breadline. Slums rise up on the sandy mounds that frame the area; brown, blocky buildings clinging to the hillside. Built slightly recessed to each other, the site can reach up to six or more houses high. There is no space between them; it’s overcrowded and hectic and looks somewhat precarious. A few people have painted their buildings in bright colours but predominantly it is a brown sea of chaos. And downtown Lima, the so called centre of the city? In some respects, it is much like other Peruvian city centres with pretty parks and plazas dotted about the place, but it is also considered a world heritage centre by UNESCO. Architecturally it has some impressive buildings and churches including the Convento de San Francisco, Catedral de Lima and Palacio De Gobierno. (See Peru This Week and Peru en RoUte for some photos of the historic centre and downtown Lima). Traditional places to eat sit alongside McDonalds and KFC and Bembos. A mix of people wander the streets of Lima, some tourists, some everyday people getting on with their daily chores, some hopefuls trying to make money out of those passing by. Overall, Lima offers what one would expect of a big city: lots to see and do, old alongside the modern, visible disparity of wealth, imposing architecture and a diverse mix of inhabitants. I got a week long peek at Lima, staying much longer in such a big place than I would usually do because it grabbed me. I avoided the usual tourist comforts of taxis and flagged down cramped collectivos and jumped on the Metro. I sampled bits of the culture and sights and all of it recharged my batteries. An energetic city by the beach with a great climate? Yes please. 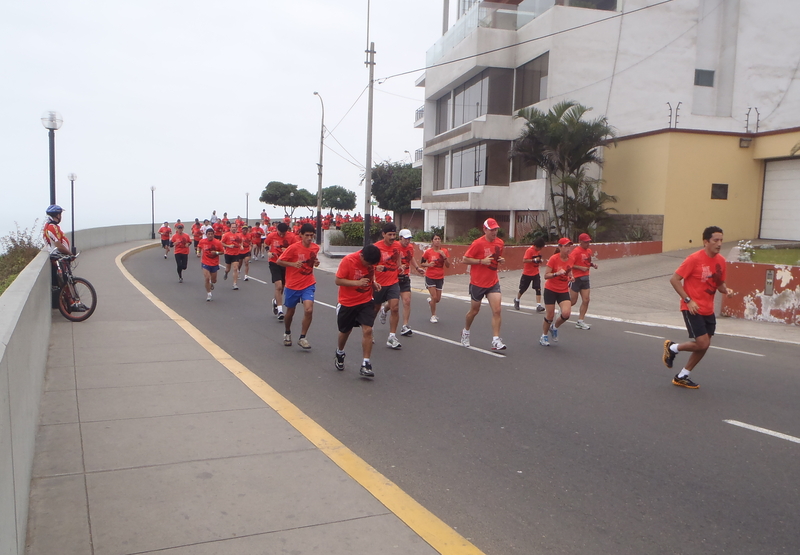 It’s 7:00AM in Lima, Peru and the city is getting ready for the We Run Lima 10km run sponsored by Nike. Stands are being set up and areas of the street cordoned off and sound systems tested. At 9:00AM the horns blow and the music starts. A group of young guys are ready with their ‘junk’ band – metal bins and brooms – along Malécon de Reserva on the bridge by Parque del Amor. Onlookers join in, clapping, and the occasional runner breaks from treading tarmac to shake their hips to the beat. I’m walking into the flow of runners (no, not being totally annoying, I’m out of their way). The sea of red t-shirts bobbing up and down makes one dizzy. There’s a real mix of age groups taking part although I can’t help but notice that the majority of runners are male. What’s that all about? I duck out and sit in Parque del Amor. The huge stone statue of lovers entwined serves as a backdrop for couples photographs and the colourful mosaic seating outlining the park acts as a rest point for couples emulating the statue. The mosaic spells out messages of love, declarations of affection and positive messages: Viva la vida, Angela’ says one. Live the life. Looking out to sea, the surf is coming in in perfect lines and peeling steadily to allow the clusters of surfers to catch rides. Most surfers stick to the Redondo breaks left of the pier, away from the beginners learning to surf at Makaha Surf Beach. They catch long left handers. The better, bigger waves are farther out; even the ones being surfed are a considerable paddle out, although it’s fairly relaxed, not too heavy on the inside. Little parks and pedestianised walkways are dotted along the road that runs the stretch of the sea front. People of all ages rollerblade, skate or longboard along the pavements, peddle their bikes, wander along hand in hand or walk their dogs. It’s a lazy Sunday morning but these guys are in full swing despite the grey start. The sun tries to push through; it’s warming up. The walk back into Miraflores up Malecon 28 de Julio takes you by the pristine tennis courts of Club Tennis Las Terrezas Miraflores, a place that smells of affluence. From the courts there are far reaching views out over the sea and for a moment I try to imagine myself living that life: weekend tennis with my friends followed by a coffee or cocktail (or is that too unhealthy for this place?). I shake the thought pretty quickly. By the time I make it back to the central park of Miraflores, the early morning stillness has been replaced by the sound of vehicles and chatter, and the streets and the parks are heaving with people of all nationalities. The Miraflores district of Lima feels wealthy and westernised, full of comfortable, homogenised places to eat, drink and shop. It feels nothing like the other parts of Peru that I have visited. On the one hand it is pleasant and familiar; on the other hand it’s horribly boring. I realise that this can’t be the full picture. Show me more of yourself, Lima.